Verify Content and validate matching Digiprove Certificate Check the authenticity of a file by reference to a Digiprove certificate file and authenticate the certificate as well. 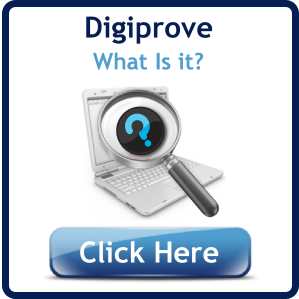 This function can be selected by clicking on the "Digiprove Verify File" link on the navigation bar. Select the content file here. The file will not be uploaded to Digiprove so its confidentiality is assured. When you have selected a content file, its digital fingerprint is calculated and displayed here. This uses a proven cryptographic algorithm that can detect even minute changes in a file. 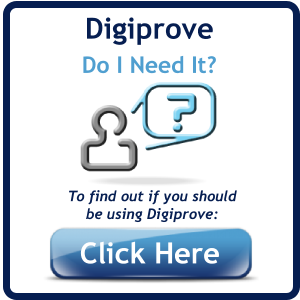 Select a previously saved Digiprove certificate file. These files usually have the suffix ".p7s" and are delivered to the Digiprove user as an attachment to the certifying email or automatically via the API. True copies can also be downloaded from our website by the user. These certificate files have been digitally signed and are tamper-proof. When you press this button, the chosen verification process will take place. If a certificate file was submitted, it will be inspected to ensure that it is authentic, (i.e. it is in a valid format and it is digitally signed by Digiprove. Also the contents of the certificate will be displayed. If you have specified a content file along with its certificate, its digital fingerprint will be compared with the one referred to in the certificate to ensure that it is the same file, and you will be shown the result of that comparison. Depending on your application/purpose this can prove the authenticity and timestamp of the file, or otherwise detect tamper. If you have simply selected a content file, its digital fingerprint will be compared to our database of Digiprove certifications, and any matches will be displayed.